Tonight is a night for a cocktail. It’s a warm, but not too warm, summer evening and I’m in the mood for something a little off of the beaten path. Something cold and refreshing, but strong enough to cut through the last bit of the cold I’ve been fighting this week. I have a lot of cocktail books on the shelf. It’s easy to get excited by them while I’m out shopping. Excited to the point that I forget that my prefered method of imbibing usually consists of only a whiskey and a glass. So yes, there are a lot there. And I’ll admit, most never end up getting read. Just as a cookbook doesn’t make a very interesting read, neither does a cocktail recipe book. Unless it brings something to the table beyond the recipe. To me a cocktail book worth reading has a few things between it’s covers. Obviously it needs tasty sounding drinks. That’s a given. To me it should also have a bit about each drink. It’s history, where it comes from or even why it works. I like to learn. It should also be entertaining. There is seriously no reason why you shouldn’t have fun reading about things that will help you have fun. I enjoyed the heck out of it. Both the drink and the book. One thing I liked especially liked about the book was it's binding. It has a large spiral binding covered by a hard backing. This is a book designed to lay flat. This is a book meant to be used. 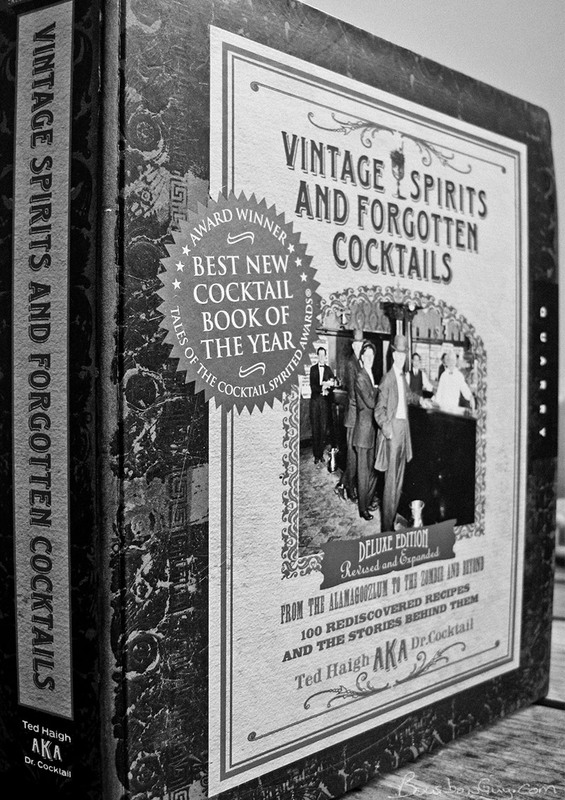 I highly recommend it to anyone who has an interest in old cocktails, fans of historical bottles or advertisements or anyone who might want to make an extra special shopping trip to pick up the out of the ordinary ingredients that are included in almost every recipe. I look forward to a few of those trips myself.